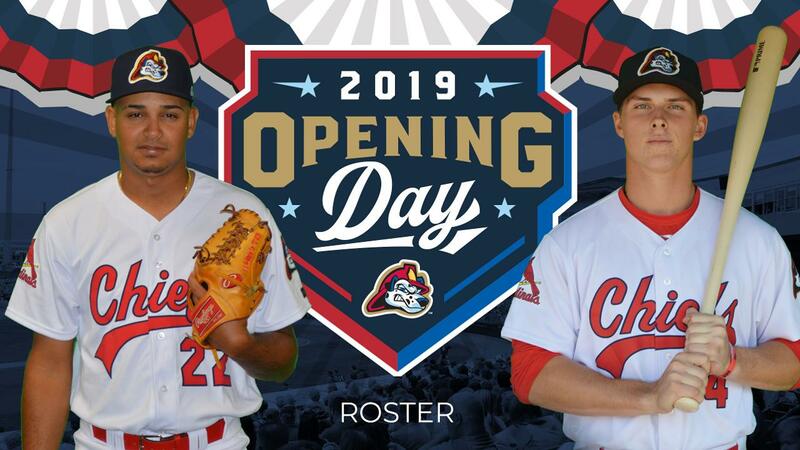 Peoria, IL - The St. Louis Cardinals and defending Western Division Champion Peoria Chiefs have announced the preliminary roster for the Chiefs 37th season of professional baseball in the Midwest League. The roster includes six 2018 draftees, two former first round picks, three of the top 30 players in the Cardinals organization ranked by MLB Pipeline/Baseball America and six players who played at least one game for the Chiefs in 2018. The top ranked prospects on the 2019 Chiefs roster are 3B Nolan Gorman at #2 (MLB)/#4 (BA), C Ivan Herrera #20/#21, OF Wadye Ynfante #25/NR and 1B/OF Leandro Cedeno NR/#28. RHP Alvaro Seijas and SS Delvin Perez were ranked by both publications before the 2018 season but are currently unranked. Gorman and Perez were first round picks with Gorman taken #19 overall in 2018 and Perez was taken #23 overall in 2016. The initial opening day roster includes 12 position players and 13 pitchers for new Chiefs manager Erick Almonte. Of the positions players, six are infielders, four are outfielders and two are catchers. We'll start with the catchers, Ivan Herrera and Zach Jackson. Herrera played 28 games for the Gulf Coast League Cardinals and two for Double-A Springfield last season batting .348 with one homer, six doubles, 23 runs scored and 25 RBI. He signed with the Cardinals in 2016 out of Panama and will enter the season as the youngest player on the roster at 18. Jackson played 44 games with Johnson City and two with Palm Beach last year batting .248 with three homers, 13 doubles and 24 RBI. A 20-year old, Jackson was drafted in the sixth round of the 2017 draft out of Winter Haven High School in Florida. On the infield, Gorman returns to the Chiefs and the teenager will man the hot corner where he finished the 2018 season. Gorman joined the Chiefs in August from Johnson City and overall in his first pro season he hit .291 with 17 homers, 44 RBI, 13 doubles and 49 runs scored in 63 games. The first player in team history to be born in 2000, Gorman was drafted 19th overall in the 2018 draft out of Sandra Day O'Connor High School in Arizona. Brendan Donovan brings versatility to the Chiefs having played multiple infield positions in college and four games at third base last year for State College in which he went 3-for-16 with two extra-base hits and two RBI. Born in Germany, the 22-year old went to high school in Alabama and was drafted in the seventh round of the 2018 draft out of South Alabama. Edwin Figuera is one of the six returning Chiefs as the middle infielder played 20 games in Peoria and 62 in State College last year. Overall he hit .289 with 12 extra-base hits, 23 RBI and 34 runs scored while being named a NYPL All-Star. Figuera is a 21-year old native of Venezuela and signed with the Cardinals in 2014. Shortstop Delvin Perez played 64 games for State College last year batting .213 with one homer, five doubles, eight steals, 22 runs scored and 21 RBI. A 20-year old native of Puerto Rico, Perez was drafted 23rd overall in the first round of the 2016 draft. Josh Shaw played every infield position last season for the GCL Cardinals and finished the year with three games at Palm Beach. Overall he hit .262 with two homers, seven doubles, 30 RBI and 31 runs scored in 49 games. A 22-year old native of New Jersey, Shaw was drafted in the 19th round last June out of St. John's University. First baseman Brady Whalen hit .209 with six homers, 13 doubles, 37 RBI and 46 runs scored in 65 games last season for State College. A native of Vancouver, WA, Whalen was drafted in the 12th round of the 2016 draft out of Union High School. The outfield features three newcomers and one player who was in the MWL for two weeks last season. One of the new guys is Leandro Cedeno, a former catcher who also has experience playing first base. Last season he appeared in 59 games for Johnson City where he finished top five in home runs (14), RBI (47), hits (75), extra-base hits (28), runs (47), HBP (11), OBP (.419) and slugging (.592) while his .336 average ranked sixth. A 20-year old native of Venezuela, Cedeno signed in 2014. Lars Nootbaar played in 56 games last year for State College batting .227 with two homers, five doubles, 26 RBI and 14 runs scored. A 21-year old California native, he was drafted in the eighth round of the 2018 draft out of USC. Brandon Riley returns to Peoria after appearing in nine games last season, though a late August injury prevented him from appearing in the MWL playoffs. Riley joined Johnson City last summer after a College World Series run and played 46 games overall batting .276 with two homers, 13 RBI, five doubles and 24 runs scored. A 22-year old native of Burlington, NC, Riley was drafted in the 14th round last June out of the University of North Carolina. Wadye Ynfante hit .213 with four homers, 15 doubles, 25 RBI, 010 steals and 33 runs scored last season in 70 games for State College. A 21-year old native of the Dominican Republic, Ynfante signed with the Cardinals in 2014. Of the 13 pitchers on the roster, the Chiefs have three lefties and 10 right-handers. RH Cole Aker started seven games last season for Johnson City after pitching seven times in the GCL. Combined he was 6-2 with a 4.29 ERA as he struck out 47 batters in 50 1/3 innings. A 22-year old native of Kernersville, NC, Aker was drafted in the 18th round last June out of the University of Tampa. Lefty Fabian Blanco returns to the Chiefs after spending all of 2018 in Peoria, including the playoffs. He pitched 44 times for the Chiefs last year going 2-1 with eight saves and a 4.33 ERA. Blanco is a 21-year old native of Venezuela who signed with the Cardinals in 2016. Another returner is RH Franyel Casadilla who made three of his total 12 starts in 2018 with the Chiefs and overall he went 4-5 with a 5.17 ERA while striking out 52 batters in 77 innings. Casadilla will turn 22 on Friday and the Venezuela native signed in 2013.Lefty Diego Cordero pitched at three levels last year and all 14 of his games were starts as he went 4-6 with a 4.41 ERA while striking out 57 batters over 75 2/3 innings. A 21-year old native of the Dominican Republic, Cordero signed with the Cardinals in 2014. RH Noel De Jesus made six starts last year for Johnson City going 2-1 with an 8.10 ERA and one complete game. A native of the Dominican Republic, the 22-year old signed in 2015. Another right-hander, Edgar Escobar led the entire GCL in appearances (19), saves (9), average against (.169) and games finished (16) last season while going 2-2 with a 1.21 ERA and striking out 33 batters to just three walks over 22 1/3 innings. A Cuban native, Escobar signed with the Cardinals in 2018 and he turned 22 in January. Righty Chris Hunt pitched for both GCL and Johnson City last year with five starts and 12 total appearances, going 4-1 with a 2.52 ERA as he struck out 28 over 39 1/3 innings. A 24-year old native of Unionville, VA, Hunt was drafted in the 39th round in 2017 out of Henderson State University in Arkansas. RH Freddy Pacheco threw nine times last season for the GCL Cardinals after beginning his season as a reliever in the Dominican Summer League. He went 1-2 with a 0.55 ERA and one save for the GCL Cardinals while striking out 21 over 16 1/3 innings. Pacheco turns 21 on April 17 and the Venezuelan native signed with the Cardinals in 2017. Another righty, Tommy Parsons dominated the Appalachian League last year for Johnson City going 5-1 with a 3.00 ERA as a Post-Season All-Star. He struck out 43 and walked just 10 over 57 innings wile racking up a save and a complete game shutout. A native of Columbus, OH, the 23-year old signed out of Adrian College as a NDFA on June 12, 2018. The third lefty is Jacob Schlesener who went 2-6 with a 4.47 ERA in 17 games and 10 starts for State College last season as he struck out 69 over 52 1/3 innings. A native of Rogersville, MO, the 22-year old was drafted out of high school in the 12th round of the 2015 draft. The sixth returnee is RH Alvaro Seijas who went 5-8 with a 4.52 ERA in 25 games, 22 starts last year while striking out 84 and walking 61 over 129 1/3 innings. He was with the Chiefs all season in 2018 and threw two shutout innings in the playoffs. A native of Venezuela, the 20-year old signed in 2015. Righty Sebastian Tabata pitched in the Dominican Summer League last year and this will be his US MiLB and pro debut. The 21-year old signed in 2017 out of Venezuela. Right Dionis Zamora rounds out the pitching staff. He was 2-3 last season with a 3.86 ERA in 12 games and 11 starts at Johnson City while also pitching one game as a reliever for the GCL squad. A 22-year old native of Venezuela, Zamora signed in 2017. As for the roster breakdown, the Chiefs will start the season with Herrera (June 1, 2000) as the youngest player and Hunt (January 16, 1995) as the oldest. There are two 18-year olds, five 20-year olds, eight 21-year olds, eight 22-year olds, one 23-year old and one 24-year old. Six of the players on this roster were drafted by the Cardinals in 2018, two in 2017, two in 2016 and one in 2015 while 14 were signed as non-drafted free agents. Five of the drafted players were top 10 round selections: Gorman 1st/2018, Perez 1st/2016, Jackson 6th/2017, Donovan 7th/2018 and Nootbaar 8th/2018. Ten players were born in the United States, eight in Venezuela, three in the Dominican Republic and one each in Cuba, Germany, Panama and Puerto Rico. Of the American-born players, plus Donovan who was born in Germany but grew up in Alabama, 10 states are represented with two North Carolina natives. Group tickets and season ticket packages, including full-season, a 35-game ticket package, an 18-game ticket package or a Flex Plan are currently on sale by calling 309-680-4000. Individual game tickets are also on sale with the Dozer Park Box Office open Monday - Friday from 10:00 am - 5:00 pm and online at www.peoriachiefs.com which also lists all of the season's promotions. Game times and promotions are subject to change.